A student studying in the Kent Business School won a £1,000 investment for an online platform that aims to connect learner drivers with instructors and in doing so reduce the cost of lessons. 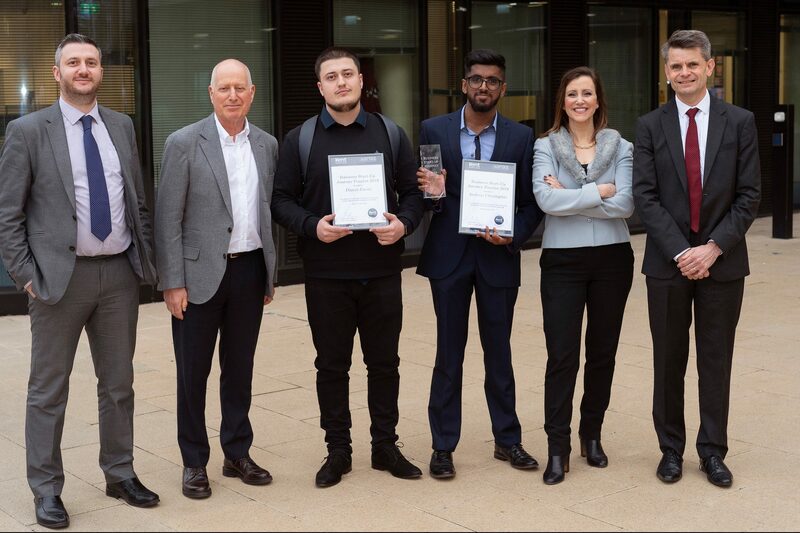 Third-year student Andrew Christopher was chosen as the winner for his idea, LDrive, by a panel of business leaders and entrepreneurs at the annual Business Start-up Journey competition run by Kent Business School (KBS) at the University. Andrew was supporting in his pitch by third-year student Dionis Emini. LDrive is designed to help learner drivers find driving instructors based on price, while driving instructors can offer flexible teaching hours. The aim is that it provides a more flexible, cost-effective offering for both learners and instructors. Two other students won prizes of £500 for their ideas. Domenico Martini&apos;s pitch for a business that helps provide cover for last-minute gaps in shifts won the best service category, while the best product category was won by Lucy Kemsley, from Rochester, and Stanislav Yakimov, from Margate, who are working to improve dental brace design. Kevin Bardwell, Santander Universities relationship manager. Audience members also included Kent County Council&apos;s David Godfrey and business people from across the county. The Business Start-Up Journey is a philanthropically funded programme offering support for students who are setting up their own businesses. It offers a combination of practical workshops, one-to-one advice, talks and mentoring. It is run by the ASPIRE (Accelerator Space for Innovation and Responsible Enterprise) project within KBS which recently hosted a national student enterprise conference at the Canterbury campus, attracting more than 400 delegates over two days.